That’s the Way the Money Goes! “This congregation should run more like a business.” How can anybody doubt that? Businesses are among our most-prized cultural creations; successful business leaders are our richest citizens. When a governing board member holds up “business” as a model for the church or synagogue, the point can seem self-evident. Except that others grumble that the congregation “feels too much like a business” and this, too, seems an obviously valid criticism. The mission of a congregation is to transform lives, not to make money. A congregation that becomes too bureaucratic and acquisitive threatens to squeeze God’s living, moving spirit out. So which is it? Should a business and a congregation be alike or different? 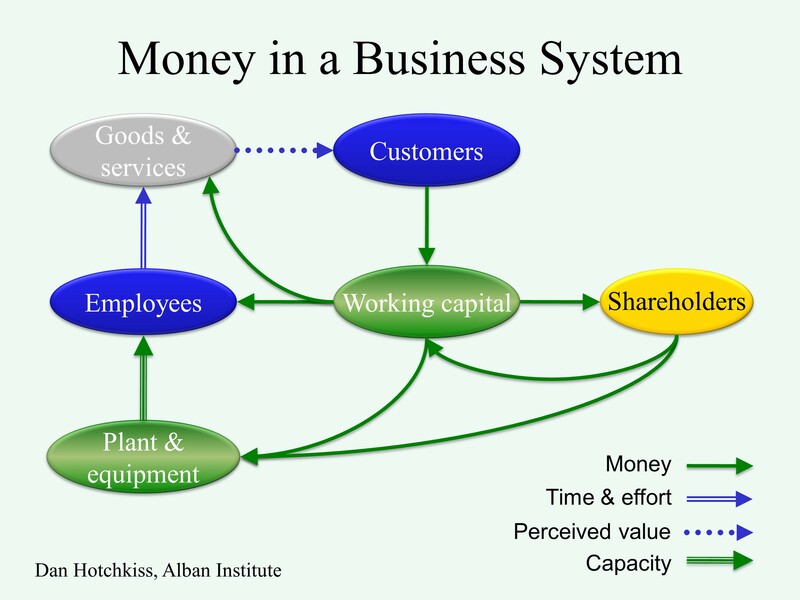 The two diagrams accompanying this article portray the flow of money and related quantities in what turn out to be two very different kinds of systems. In a business, shareholders are the alpha and omega, money-wise. They contribute the initial capital to start a business, including cash (“working capital”), real estate (“plant”), and machines (“equipment”) that together provide the space and tools (“capacity”) for the firm to produce goods and services. Customers replenish the supply of working capital by buying what the firm produces. Why? Because they perceive value in it—right or wrong. Customers refill the fund of working capital, enabling the company to maintain plant and equipment, pay employees, and buy raw materials, services and other inputs that it needs in order to keep cranking out the widgets. Many companies fail because they get mixed up about the role of perceived value. It is not enough to build a better mousetrap; you need customers who think your mousetrap is worth more than you’re asking for it. Perceived value, not the real McCoy, is what makes people into customers. If we liked, we could complicate this picture. We could add banks and other lenders (which often provide as much or more of the initial capital than shareholders do, and expect to be compensated for their contribution). We could separate some special kinds of contributions employees make, for instance, marketing, which may contribute as much or more to the perceived value of the goods and services than the production workers do. But for our purposes, this picture will suffice. 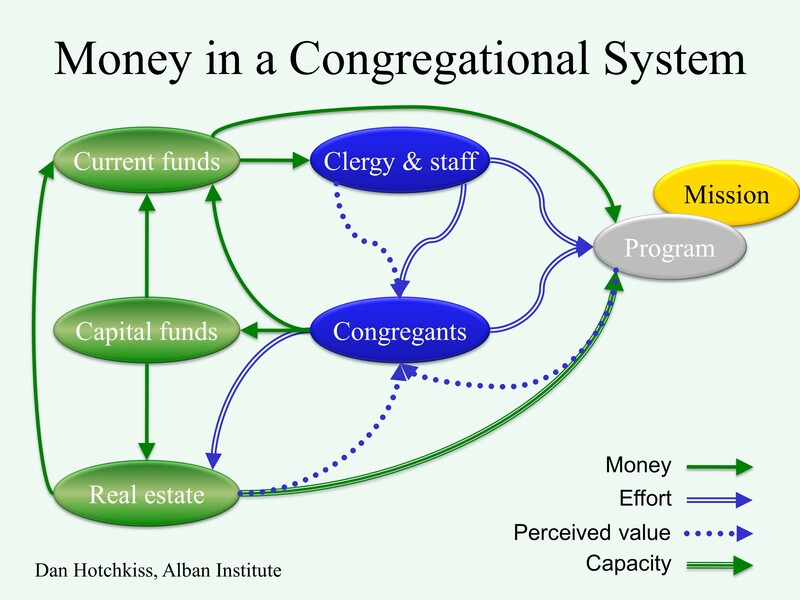 The second diagram shows that the role of money in a congregation is a bit more complicated. While for business everything begins and ends with stockholders, the congregation diagram converges at two points: the congregation and the program. In “program” I include all that a congregation does, including worship, education, social ministry, and giving money to the needy, other charities, and denominational bodies. Lurking at the side, partially obscured by all of the activity (“program”) is the congregation’s mission. What is the mission? That is for the congregation and its leaders to discern. A congregation’s mission is its unique answer to the question, “Whose lives do we mean to change and in what way?” A given congregation’s mission may include influencing the lives of members by its inward-focused programs or of others through service and contributions. The mission, like stockholders in a business, has the moral right both to control the congregation’s actions and to benefit from them. The fulfillment of the mission is not measured in dollars. Instead, we evaluate the mission by evaluating program—and so program stands as proxy for the mission, but the two are not the same. A common error in evaluation is to measure indicators of program activity like attendance without relating the activity to the desired result. High attendance in youth ministry is a positive—but only if the young people’s lives are changed in good ways! The congregation’s mission is the yardstick for measuring program effectiveness. The other center of money-related activity is the congregation itself. Congregants, alive and dead, are the ultimate source of most of the money. They give in two main ways: to current funds, which pay salaries and program costs; and capital funds, including funds for acquiring property and endowment funds invested to produce a flow of income. The other major inputs into the program are the time and effort of the staff and members of the congregation. Like customers in business, the congregants will continue to provide money and effort if they perceive value. It is not enough to fulfill the mission or provide a high-quality program—the value has to be visible to those who pay the bills. Most congregants perceive value through their appreciation of the program, of the clergy and staff, and of the building. Only a few see past these concrete symbols to perceive the value of the mission itself—a good goal of leadership is to increase that group. Looking at the congregation diagram, leaders will see choices their congregation has made. For example, some congregations rely on capital funds contributed long ago and ignore the fact that too much money flows out of capital into current funds. Even less visible is the flow of value from real estate into current funds when a congregation uses a building without keeping up with necessary maintenance. Clergy and staff also choose how much time and effort they will allocate to developing program as opposed to redeveloping the congregation. Too much focus on the congregation and the mission suffers; too little and the goose that lays the golden egg will starve.